Recycling isn’t just good for the environment — if you have a rental property, it’s also a great way to reduce the amount of trash that’s collected in your apartment building’s dumpsters. 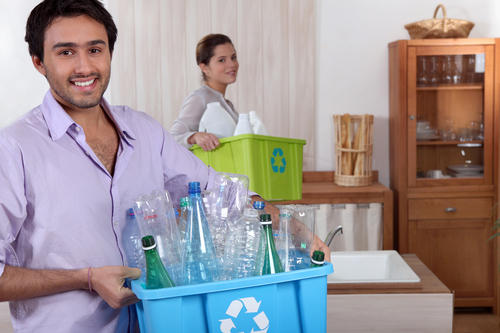 If you’re a landlord and want to encourage your tenants to recycle, Arc Property Management Group says there are several things you can do to start the movement. Post Flyers: If you want to deter your tenants from throwing everything in the garbage, post flyers near the dumpsters on your property to remind them to recycle reusable products. Since some people may not know what items are recyclable, it’s also a good idea to list these things, like pop cans and cardboard boxes, on the posters as well. Distribute Flyers: In addition to just posting signs, you can also distribute flyers or brochures to all your tenants. This is a great way to inform them of your property’s garbage disposal rules, as well as to remind them to discard recyclables in the proper areas. Furthermore, if you’ve just established a recycling program, passing out a flyer is the best way to unveil your new system to your renters. Hold A Community Discussion: If you’d rather explain your property’s garbage disposal and recycling rules in person, schedule a community meeting with the residents in your apartment complex or condominium building. You may also consider bringing in a guest speaker from your area’s local recycling center to talk about the benefits of recycling. Encourage Donating: If you’re looking to reduce the amount of waste your tenants produce, talk to them about the benefits of donating. You can send out a brochure with local donation centers in your community so that they know where to take items they no longer use, rather than throwing them in the trash. Looking for more helpful landlord tips? Call the pros at Arc Property Management Group today. You can reach them at (800) 769-8084 to see what other ideas they have to share. And, if you’re interested in hiring a property manager to oversee your rental property, check out their website to learn more about their commercial and residential property management services.